The 2016 Hyundai Elantra GT Review: The car market is packed with compact sedans that deliver more than basic transportation. The Hyundai Elantra, which when rated on interior capacity, actually sneaks into the midsize category, is one of the best. However, for more action and function, try the Elantra GT Edition. 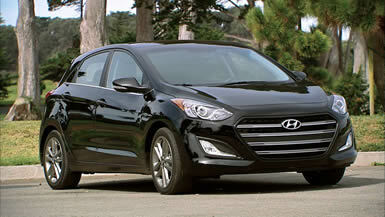 The GT gets a tauter suspension than ordinary Elantras, and the Style Package, for only $1,975, tightens it up a bit more. You also get meatier tires on new 17-inch rims, up from the standard sized 16’s too. My 2016 Elantra GT tester, in Black Noir Pearl, came with the automatic transmission, and had the Style package, which enhanced the car a lot. As I did not test the car with and without the package, it’s hard to compare directly, but my Elantra GT provided entertaining handling on the two-lane back roads and smooth, quiet performance in the commute lane, too. Hyundai’s fuel economy meter resets with each fill up, so it’s hard to get an ongoing fuel economy number, but I did average 27 mpg, spot on with the EPA’s combined figure (33 Highway, 24 City). That made it one of the most efficient cars I’ve driven over the last several months, without being a tiny fuel-sipper. In one run of nearly all freeway driving, I achieved 31.7 mpg, so the EPA’s numbers are pretty darned accurate. EPA Green Vehicle scores are a midrange 5 for Smog and 6 for Greenhouse Gas. Part of Hyundai’s recent success is their Liquid Sculpture design, which is not only on all their vehicles, but is already in version 2 on a few of them, for example, the 2015 Sonata sedan. The 2016 Elantra GT wears a version 2 nose on its version 1 body, so the lines are curvier until you hit the more linear, intense face. They pulled it off for now, as the next-generation Elantra is a year or two away. The inside of the Elantra GT has a carved, energetic feeling (credit Liquid Sculpture 1), and the materials are first-rate. The matte black finish with silver accents evokes a pleasing, substantial ambiance. A pass-through center console, a la Volvo, offers multiple storage locations but doesn’t feel massive. The ellipses on the front doors convey motion as they cut into the wide panel between the front and rear doors. The GT gives you standard Driver Selectable Steering Mode, a feature normally found in much more upmarket vehicles. Using a console button, you can select Normal (a safe bet), Sport (for backroad blasts), or Comfort (think long, straight freeway runs). The Elantra GT offers standard heated seats, leather in my tester, thanks to the Tech Package ($3,950). Those seats are also ventilated, a rare item in a car that’s priced way under $40,000. The package also provides an all-new navigation system, praised in the Sonata and Genesis further up the family tree. The seven-inch display is intuitive and easy to grasp without consulting the owner’s manual, and offers a split screen, so you can monitor a map, and your audio selection at a glance. Hyundais are designed to be very easy to interact with, and they offer lots of electronic extras. This car came with standard blind spot monitoring, for example, one of the best safety features of the last decade. The rearview camera, amusingly, peeks out from behind the rear logo, which rises only when needed. Pricing begins at a mere $18,880 for a manual transmission car without packages. My tester, with the Style and Tech packages, totaled out at $26,675. It competes directly with cars like the Mazda3 and Volkswagen Golf, and, even with a few years on the design, does it with flair. The Bottom Line: The 2016 Hyundai Elantra GT is based on a different Hyundai model than the other Elantras, as this five-door gives you a handy hatch, and rear seats that fold flat. This is a blessing not only for daily users, but for Costco shoppers and active travelers as well. You might not think of a five-door hatchback as the kind of sporty ride that the name “GT” implies, but this 2,904-pound car steps up with a 2.0-liter inline four-cylinder engine that pushes out 173 horsepower and 154 lb.-ft. of torque, versus the more modest engines in the sedans. And you can match it up with a six-speed transmission, as a manual or an automatic, as your personal choice. With the buying public once again embracing five-door hatchbacks, the Elantra GT may be the best ideal car for the price. And maybe, just for those reasons alone, you should “Drive one, Buy one, Today ©”.